Release of Liability forms help protect businesses, event organizers and sports clubs if someone becomes injured while performing the sponsored activity. Activities you may want to have a Release for include marathons, bike races, travel tours, music festivals or sporting events. Your business or organization provides physical activities. Your sports club needs a Release Form for its team members. Your travel company needs a Release to be signed by your customers. You are an event organizer who needs a Release signed by volunteers and participants. 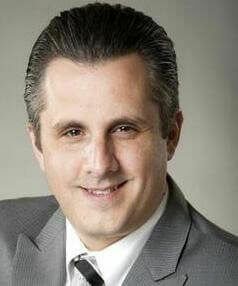 A Release of Liability can help you protect your business or organization should an incident occur. It is simple to make using Rocket Lawyer and the forms can be printed or shared online. 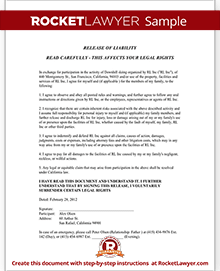 A wide range of businesses use Release of Liability Forms most commonly those that involve a physical activity, but other companies use them as well. A volunteer organization or company that provides physical activities that could lead to injury often require participants (or their parents) to sign waivers. Activities may include dance classes, zip-lining, swimming, rock climbing, river rafting, batting cages, and more. If you provide travel services, you may also want to require that your customers sign a waiver. Travel services may include travel planning, bus tours, walking tours, party buses, river cruises, and so on. Sometimes event organizers ask participants to sign a waiver. Events that often require participants to sign a Release of Liability include marathons, fun runs, bike races, festivals, sports tournaments, corporate team building events, and more. 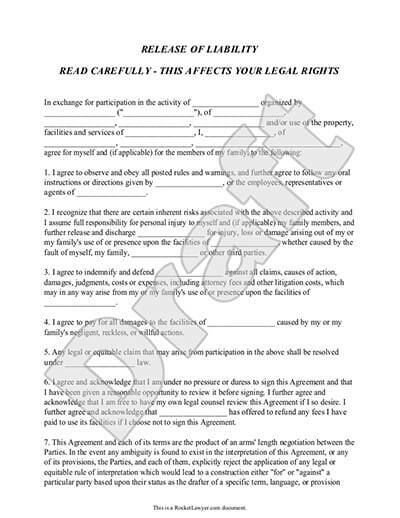 In many cases, you'll want to fill out your part of the agreement and print out numerous copies for your customers to fill out on-site. As an added layer of protection, you may benefit from checking IDs when they hand the form in to verify that they are of age and that they are who they say they are. A Rocket Lawyer account also allows you to send the form directly to an email address, so they can sign online if needed. Online signing is a good option if you could benefit from sending out forms in advance of a large group activity. There are some injuries that a Release of Liability Waiver won't protect you from, namely negligence on your part. A Release of Liability does not prevent you from being sued, but it does shift some of the "burden of proof" reasonability to the injured party. For example, if you run a rock climbing gym and a patron falls because one of your climbing holds became loose. You might have a hard time getting out of that one. However, if your guest didn't follow the rules and was running through the gym and tripped, you likely have a chance of fighting it if you can prove your case. State laws vary on how strongly Waivers are enforced; you may want to ask a lawyer to review your Release before you start using it. An accurate description of the risk involved may help if you should be challenged. This can help in two ways. The first is that it helps you if a patron is injured and your waiver is tested. It also helps educate the signer about the risks involved in the activity. The participant's signature on the Waiver shows that the participant was made aware of and acknowledged the risks. Does this waiver cover the Release of Liability for a sold vehicle? No, it does not. This is not that type of release document. To obtain a Release of Liability for a vehicle you sold, visit your state's DMV webpage and fill one out online. If your state does not support online form submissions, you can usually download a copy from their website and mail or fax the copy to your state agency. Our step-by-step interview process makes creating a printable Release of Liability easy.